But when I walked down Bacon and hit the corner where it intersects with Newport Avenue and saw all the people and picket signs and heard all the noise, a feeling of hope lit up my body like Christmas lights in Times Square. My first thought was: “Look at all those beautiful people standing in behalf of our brothers and sisters who’re penniless and homeless and living on the streets.” But no sooner than I entertained such a notion the reality of the situation rushed in where, the moment before, my elation had been. I don’t think I had ever in my life experienced such a sudden change of emotions. What was scary is that they asked these questions as if they actually expected “Yes” as an answer, as though because you’re standing there protesting the insensitivity of a respected business, that you support such negative depressing scenes as they had outlined in their questions. Oh, what a sad day in OB, so filled with mob mentality that these people didn’t see that their declarations of “We’re not talking about all ‘bums,’ just those who cause problems” rings hollow because the sticker made no distinctions between “good bums” and “bad bums” or “bums in between.” The sticker is just plain mean. Now, I could have possibly supported the sticker if it had featured some cleverly created outrageous caricature of a super aggressive panhandler of some kind that managed to make it clear that an attack on all homeless people was not the intent. But the sticker was way too serious and insulting to accomplish that. But even if the sticker was warranted for 99.9 per cent of OB’s homeless population someone needed to stand in front of The Black in behalf of that one tenth human being who didn’t fit the profile, who cowers in the shadows, broken and hungry with no home, without a feeling of hope anywhere in his or her soul or bones. As my sign indicated: children are watching. And what one boy, in particular, saw that day didn’t inspire hope for the future, as he came upon the scene peacefully and in a matter of seconds joined the raucous crowd who jeered and got in the faces of those of us who dared to stand for what’s right and speak for those with very little voice in our world. So, in light of the actions of that young boy, I say to the man, who lashed out at me with his insulting accusation that I was “wasting” my time,” it is never a waste of anybody’s time to model compassion for our children – especially when not one news coverage of the event even mentioned how children might possibly be affected by such callousness as was displayed in front of a business that proudly puts profit over the welfare of struggling people. How can we expect our children to better their world in the years ahead if we don’t show them how to solve problems in decent ways in a spirit of love and caring for their fellow human beings? It was only one child dude.Don’t let it get your hopes for the future down.Not many are like that,just as not many Obecians are like that.How many people live in OB?18000 something? How many people were being jerks the other day?A few dozen? even if it were 100 it is a small percentage of our population. 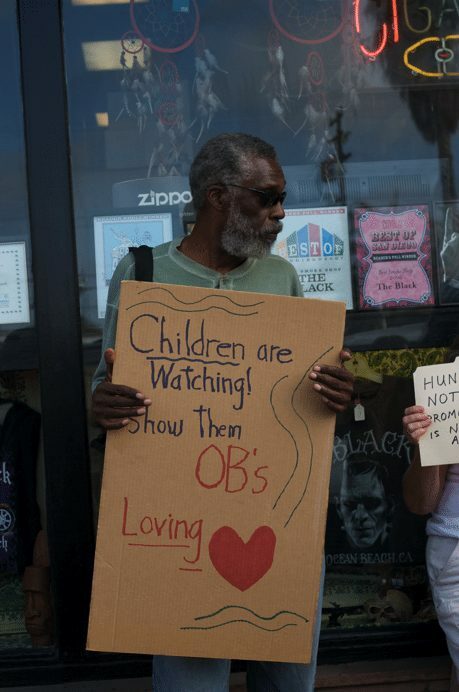 Everyone is saying ob was cast in a bad light.If there were a crowd of thousands marching down newport perhapsId see it that way,but the antibum,prosticker, iwannabeanidiot movement was just a few.I liked your sign though. I stopped to watch the goings on for a bit but left because things were getting hasty and my 1 year old daughter was with me. where are the weekly OB news updates? Only thing worth reading on this site. Hey OB Warzone- thanks (I think) for noticing that we haven’t run an OB Flashes for a while. I’ll plan on putting one together just for you – to see if we can win ya back. It’s a great blog. I love opinions and know that everyone can’t agree on a particular thing, but it seems that over the past few weeks this blog has lost it’s focus on the community as a whole & has focused on a very small portion of mostly non-residents. I understand the issues & clearly see both sides. So…yes, the issue is now out there. Let the city/churches/organizations/non-profit groups run with it & see that happens. After all, they are the only ones who can truly help the issue in a BIG way. The blog when big, made some new readers & might have lost a few. Let’s get back to what made this forum great…covering ALL topics of Ocean Beach. Ditto. Plus we’re always in a need for on the spot street reporters. Any interest? Ah, Ernie. The inspirational insight and road less traveled perspective you present in your article is welcome and uplifting. It was very clear to me that day that being out there speaking up for those who could not speak for themselves was indeed worth my time. While I was not at all prepared for the mob mentality we encountered, and at times wondered when the public floggings would begin, I would do it again for the one in genuine need of assistance. The children are watching OB continue to deteriorate into an even filthier and more hostile transient refugee camp. I don’t take my kids down there anymore and the businesses are going to continue to suffer as long as this scourge is ignored by law enforcement. Psychotic transients are one thing and should be cared for. They are not cared for because it is nearly impossible and very expensive to have these people placed under conservatorship and institutionalized. They are unable to care for themselves, and they can be dangerous to the public at times. The drug addicted/alcoholic/loser transients need to be dealt with harshly and not feeding them is the first step. A mentally competent person cannot live like that in their own filth without the aid of drugs or alcohol. As long as they are given free food everywhere, they can spend their SSI checks/panhandling/stolen $ on booze and drugs and they do. Every dime you give to a transient goes into intoxication. Every morsel of free food frees up $ for drugs/alcohol. Forcing these people to become sober by making them pay for food with get many of them off the street on their own, or at least willing to enter into the myriad of treatment programs and rehab programs that have been set up. It also reduces the workload on our local hospitals especially UCSD and Mercy where all of these transients are taken when the gash their heads open falling off a bus bench drunk. Note: I worked on the SDPD Homeless Outreach Team and I know of what I speak. These people are a menace to our society and contribute nothing to it except an additional expense similar to illegal immigrants. At least illegals are hard working and productive and add some value to society, transients only take. Having first hand experience being chased and captured by the SDPD Homeless Outreach Team, I can corroborate that the views expressed here by “Froggy” would be entirely consistent with some members of that team. Seriously,how did you get job in an outreach program? Talk about being in the wrong profession. The outreach and grab you program. Since they passed the city ordinance that allows sleeping outside overnight during certain hours, I haven’t had much contact with them. Thankfully. Bum is a mentality and not a person. This breed of young transient is doing a disservice to the “real” broke downs…the Homeless vets, those with disabilities that our society has turned its back on and those people should be kicking the asses of these otherwise healthy and able kids that “just don’t want to work”. Don’t want to work? Find a job that you truly love. That’s a personal quest. I see a bunch of coattail riders getting the free ride that these types are after. And I too have a bit of personal experience with this as my sister Chellie was a bum living on the streets of OB. She’s dead now and I’m sorry to say that she’s much better off. No more endless trips to rehab. No more watching my mother cry when she “fell off the wagon into the pile of meth”. No more police coming to my mom’s place when she decided to show up and wreak havoc. That link has been posted here 3 times and I’ve not seen one single sale from any one in OB. Every kid I see on Newport with their hand out reminds me of my sister. I don’t contribute to someone’s early death by enabling them. And BTW- the facilities that were put in place for the street fair need to be there 365/24/7. Sorry for my meltdown. This whole big thing reminds me of my sister. I kinda miss her. As for the charity I don’t know what’s up on their end.We donated our time to a cause that seemed worthy; we “did something”. Wherever the $$$ goes that’s not in my scope of knowledge. you need to get the paytoilets that other cities are purchasing with autocleaning systems and time release doors.You can’t use regular portapotties because they are going to be occupied all the time and turned into residences. (not to mention pretty stinky).The new toilets even have weight restrictions or the door won’t close,a deterrent from having multiple people in them at one time.I had a friend who recently died of a heroin overdose in a burger king restroom.He was homeless,so his family let him camp in the backyard.Couldn’t let him in the house because he’d steal everything.So he’d beg for change at freeway onramps,go score some H and shoot up in restrooms or wherever he could.If you saw him you’d swear he was a young able bodied man too.But he was addicted to a drugs like many are on the streets.That is an illness that’s tough to come out of on your own. I for one am not too upset or put out by someone personally using tough words with me such as “bum.” They just better be able to take it too. But in terms of a better world for the next generation and those coming generations, I think the future, if the sales of these stickers etc. are any indication, may be looking up. What may have initially been a valid business concern–intoxicated or unruly homeless people potentially driving away customers–has now, through the sales of these stickers, shirts and hats created an environment where it’s o.k. for the more vulnerable among us to be treated as less than equal–so long as it is being done for profit and not for reasons of hate. Money is king. And a community that, from all accounts, was for years pretty accepting of others as equal human beings has now become, to some extent, one that ranks its members according to job and employment status and where ones ability to consume in the public market place determines human worth, dignity and status. And those of the economically viable who are respected today, may not be tomorrow– in the eyes of future generations. Indeed, it is never a waste to model compassion for children or to stand up tall for those who are struggling. Thank you for this reminder, Ernie, that children are always watching and are always looking for guideposts as to how to work within the world. Let’s teach them kindness and hope and caring and humanity. My heart feels hope knowing there are people like yourself willing to embrace compassion over disdain. You know the saying about we can tell a lot about a society by the way they treat their children and prisoners. We could add the disenfranchised. I understand it’s not “pretty” or easy to deal with “street” people. Yet, anytime we make assumptions about an entire group of persons we’re harboring a prejudice that needs to be examined. Let’s no pretend to ourselves. I’ve worked in the addictions arena for way too long to agree with Froggy’s simple, naive, and seemingly “cold” solution to addiction: stop feeding people. Are you kidding??? Ernie, the gods are smiling upon you for your loving concern for others and for children. You make my heart sing. We sure are getting a peek at our society through this homelessness issue in OB and the peek is particularly not pretty because what we’re seeing is taking place, in spite of all this, in a community I view as quite the place. Over the 48 years I’ve been in San Diego I’ve seen citizens of OB accomplish remarkable things, taking on City Hall and corporations for the “public good,” creating a food coop, a great dog beach, school programs, not taking crap off the police at a time when they were pretty much out of control, standing up against the war in Vietnam unlike any community I know of in the country… I love the place and I feel it will come around and show the world how to best deal with the homeless, finding a way to separate the real “bums” from the overall issue. That would be OG OB. Hey Ernie…could you give just a little more background on this picket? I’m at the teachers’ convention right now, but had heard nothing about the issues. Get into the Church of the Subgenius. Their #1 tenet is “Slack” and with the efforts put forth here to maintain and defend the concept of “slack”….well, let’s say that Ocean Beach to the Subgenii is like Colonial Africa to the Christians. Slack doesn’t pay the rent. Wish it did, but it doesn’t. I’m going to personally contact them and see if we can’t get world HQ relocated here. Please keep me/us posted on this matter… and please let us know if there will be another solidarity event(s) coming up… ¡Gracias! A note on the “First Amendment rights” bit the counter-protesters were apparently going on about. People don’t seem to understand that the First Amendment prevents the government from restricting speech. It certainly DOES NOT mean nobody can criticize you for what you say. I don’t know where people get this idea. Anyone remember the days before the booze ban and what the end of Newport used to be like? Nope, I must have been drunk. Talkinghead – why don’t you tell us! I remember it being 10 times cleaner (and safer) than what the cliffs just south of the Silver Spray Apartments look like now that the booze ban is in place. …ah yes the good old days, when the bums and the homeless weren’t an issue in OB. I’m curious…. why does “peace, love, and tolerance” have to be incompatible with the notion of “limits” and “boundaries” (which everything in nature has)? And if some folks are arguably abusing your “hospitality”, where’s the “love” in continuing to tolerate, or even enable that? Speaking for myself, I see “peace, love, and tolerance” as very compatible with the notion of “limits” and “boundaries.” And, under normal circumstances, I wouldn’t and don’t tolerate or enable anyone who abuses my “hospitality.” Being a loving human being doesn’t include, in my way of thinking, being a doormat which, I guess, is a way of saying I love myself. A lot. And neither can I tolerate, as it relates to the homeless problem, the kind of inclusion of all the homeless in the category of “abusing a community’s hospitality.” The “sticker” did that ever so well and the next thing I knew I was standing on a picket line. Kind of a current in the story of my life. Understood, though funny how this little “sticker” apparently crossed your “boundaries”, when aggressive panhandling or someone peeing in your doorway doesn’t. Maybe that’s part of the problem, that some folks are so enamored with a certain self-serving “idea”, they refuse to accept the “realities”, let alone do anything about ’em. When that happens, I think it’s called Narcissism. Who are you, mateo? You must have no idea what the boundaries are of anyone who posts here, it’s obvious in your comment. To say that Ernie or any of us condone aggressive panhandling or someone peeing in your doorway… that is illustrating your own self-serving idea. We’ll excuse your “Ignorance” this time. Where did you ever get the idea that aggressive panhandling or someone peeing in my doorway doesn’t cross my boundaries. Is my ability to communicate that bad? Again: I’m opposed to lumping all homeless people in the same bag. And how is standing up for somebody self-serving and how is not doing something about the problem. Well, anyway, I’m getting the sense that I’m wasting my times responding to you, Mateo, as you don’t seem to understand what I’ve tried to say when I’ve said it as good as I’m capable. Or maybe you just want to screw with me and that’s crossing my boundaries. That’s unnecessarily aggressive, too much like peeing in my doorway.